Knock, knock! Here I am!!! 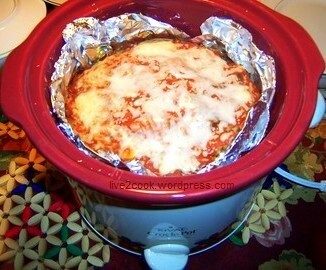 Posted by live2cook in Cherishing Dinners, slow cooker recipes. What would you like to do in your weekend after a hectic work week? In our house, we have a movie and dinner night. We get a movie from our public library or pick a movie from HBO and set up the dinner in front of Television. To make it special, I will prepare a recipe from cuisines other than from India. I and DH enjoy our dinner and movie. Though we have dinner together on week nights, we will look forward for this special movie night dinner. Since my commute to work takes most of my time now-a-days, I have started experimenting recipes with slow cookers or crock pot. This way, we don’t miss our most cherished dinner. 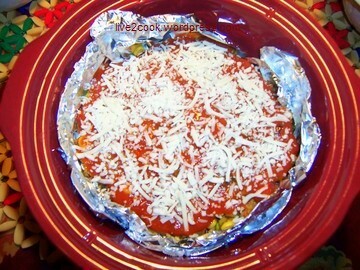 The recipe that I tried last week is “Enchilada Casserole”. 1. Soak masoor dhal for 1 hour in hot water. Drain well and grind coarsely. 2. Drain the Canellini beans, wash and grind coarsely. 3. Heat a teaspoon of oil in a large pan. Add the chopped onion and fry till slightly browned. 4. Add carrot, spinach, corn kernels and sauté for few minutes or until the spinach wilts. 5. Add the ground dhal and beans and start sautéing. 6. Add the remaining oil teaspoon at a time and sauté until the bean mixture scrambles. 7. Add the salt and cumin powder. Mix well and turn off the heat. 8. Line a 5 Quart slow cooker insert with aluminum foil. 9. Place 3 tortillas, spoon 1/3 of the bean mixture, pour 1/3 of the enchilada sauce and sprinkle 1/3 of the cheese. 10. Repeat the layers and finish with cheese. 11. Set the slow cooker and cover. 12. Cook in high for 3 hours or until cheese melts. 13. Unwrap the aluminum foil and serve. This is my entry for the Event, Beautiful Bones , hosted by Food Blogga. 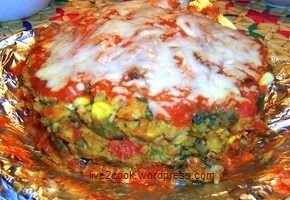 wow great entry, Enchilada Casserole looks really yummy, and very nice recipe!!! I love the idea of movie-dinner night. It gives you something special to look forward to eat week. And your casserole is the ideal movie food–fun, tasty, and easy to eat (so you don’t miss anything on the screen). Thanks so much for a delicious entry! Oh yeah! It really gives some relaxing time and boosts up energy for the whole week ahead. Pink lentils. I have one that I cook so I will have to try this. If you can get them, try black beans instead of the canelli or kidney beans. Chandra on My First Meme! what's happening in blog world?